Cars, trains, boats, planes, e-bike, and even a horse-buggy — your journey through Myanmar will be filled with every mode of transport imaginable. But nothing beats transit by foot in this part of the world. 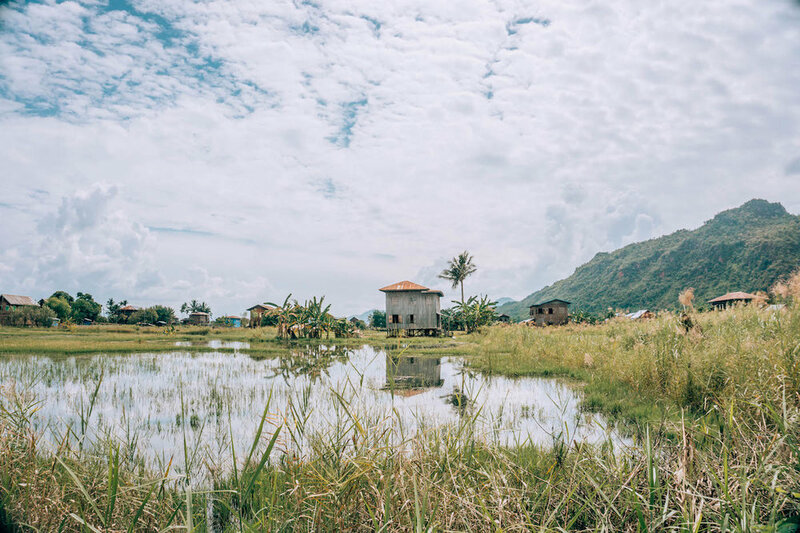 One popular trekking route is from Kalaw to Inle Lake, which winds through the Burmese countryside, tiny villages, and acres of farmland and rice paddies. It was a highlight of my entire trip, and is my top recommendation for people looking for unique things to do in Myanmar. Here are 7 reasons not to miss an Inle Lake trek, and tips for when you go. 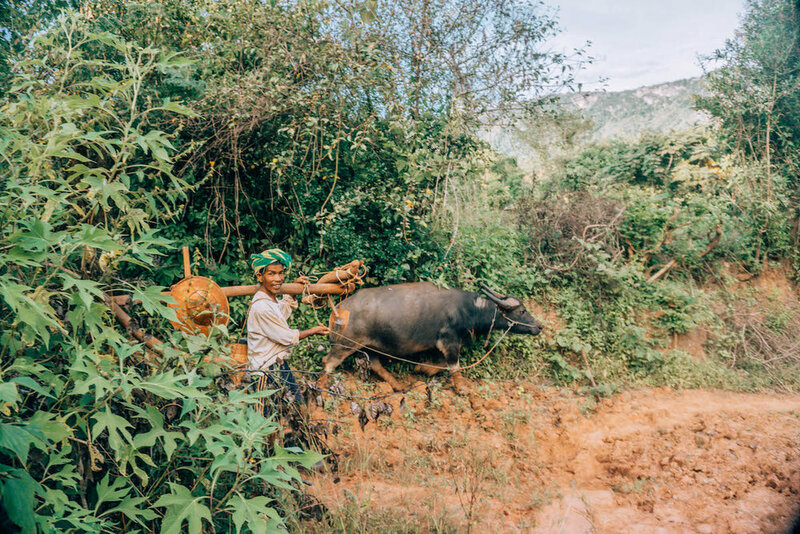 With a wave goodbye, and with my luggage in town, my driver dropped me off in a small, rural village just outside of Kalaw — a small town tucked in the Shan Hills of central Myanmar, known mostly for its weekly mass markets and nearby elephant sanctuary. I’d be reunited with my suitcase in a couple of days when I arrived to Inle Lake, and in the meantime, I had a clean shirt, some sandals, and sleeping clothes packed away in the rucksack I’d carry with me over the next couple of days. I’d done treks before in Asia — for as short as one day and as long as ten — and have never stopped being shocked at much I’ve loved them. For some people, the thought of a multi-day trek and living out of a backpack evokes a sense of dread, perhaps because the idea of doing nothing but walking all day every day sounds strenuous and dull. But really, there’s so much more to trekking than that, and in the midst of all my adventures around the world, my Asian treks have stood out as major highlights and my top recommendations. My 2-day, 1-night trek from Kalaw to Inle Lake in central Myanmar was no exception. I can’t recommend it enough, whether you’re a seasoned trekker or hiker, or whether you’re completely new to outdoor physical activity. Beautiful scenery, authentic culture, and the once-in-a-lifetime opportunity to sleep in a monastery are just some of the reasons why you can’t miss this activity. It’s true: all of Myanmar is really beautiful. You’ll even get glimpses of those epic, lush natural landscapes in areas like Sagaing outside of Mandalay, and while cruising your e-bike around Bagan. But this is only a small taste of what you’ll find on your trek. With each kilometer, you’ll walk through the most stunning natural landscapes imaginable: acres of farmlands, corn fields, and rice paddies stretching as far as the eye can see; shady, overgrown forest paths dappled with sunlight and dew; trails through towering bamboo trees; hilltop viewpoints that look onto the grassy rolling Shan Hills; and picturesque villages, with gardens covered in bright red chilis and golden corn. Your mornings will start in a thick cloud of mist and fog, as you silently and sleepily depart from the village in which you slept the might before. Your days will be sunny and hot (most likely), with the bluest skies and puffiest clouds you’ve ever seen. Your evenings will welcome you to your resting point with an epic golden hour, followed by a glowing sunset, followed by the darkest night and a sky full of stars. If you’re anything like me, you won’t be able to stop gasping every time some new horizon comes into focus. And you probably won’t want to stop taking photos, so be sure you have a camera and plenty of space on your memory card. There’s really no better way to appreciate the beauty of the Burmese landscape than getting out into the countryside on this trek. Sleeping in a monastery was the bucket list item I never knew I had. Although you also have the option to sleep in a homestay while on the trek, if possible, I highly recommend having your guide organize a night in a local monastery. Of course, don’t expect anything luxurious, but you can expect the utmost hospitality. When I arrived to this little village at the end of the day, I stopped in the local monastery where my guide helped request a place for me to sleep. The monks welcomed me without hesitation, and laid out a sleeping mat, blankets, and a on the creaky wooden monastery floors, made private by a large curtain suspended by the interior teakwood pillars. Because monks don’t eat past noon, a nearby homestay cooked me dinner and let me use the bathroom, wash up, and change my clothes. After dark, I walked over to the monastery and collapsed onto my sleeping mat for the night. It might sound rustic, but I can say I had one of the best sleeps of my life (possibly due to the lack of any lights within a thirty-kilometer radius, or just from sheer exhaustion). In some villages and cities, monks are required to leave the monasteries in the morning to go collect food from willing donors; however, in this village, locals bring food to the monks early in the morning. So, although I had set an alarm on my phone as a precaution, I instead woke up to the clanging of pots and dishes as donors arrived to the monastery with curry and rice. The entire experience was completely surreal. Sleeping alongside red-cloaked monks on the wooden floor of an ancient monastery, and waking up to the mist drifting through the open windows as the morning breakfast ritual commenced, was truly a once-in-a-lifetime opportunity that I’m so grateful I didn’t miss. And if it wasn’t already on your bucket list, I hope it is now. As with other treks I’ve done in Southeast Asia, my trek in Myanmar offered me some of the most interesting conversations during my time in the country. Although not all guides will speak English well or be great conversationalists, I really lucked out with mine, Mr. Qual. He owns a company called Kalaw Trekking & Biking Tours, and you can book your trek (or cycling tour, if that’s more your speed!) with him by email at jskhual@gmail.com. Mr. Qual and I talked about everything under the hot Burmese sun (and beyond). Childhood, life back home, our families, our jobs, and so on. But there’s something about spending multiple days with someone while doing physical activity in the heat, that sort of breaks down barriers, and opens doors to really meaningful topics of conversation. So in addition to chatter about normal daily life, we also discussed the ethnic violence in Myanmar, including his views on the situation and how it’s affected his life, and my perception of the situation from media coverage. We talked about gun violence in America, our career goals and the challenges we each face in reaching them, and other topics that I otherwise would have never had the opportunity to discuss with a local. I’m all about cross-cultural conversations like these, because in some way you’re able to be challenged by different perspectives and experiences, and in other ways you’re simply challenged by how similar you are to this foreign stranger. And because it’s part of your guide’s job to answer your questions, explain about local culture, and otherwise engage you in all that is Myanmar, he or she will most likely be willing and eager to have these kinds of conversations with you (as long as you’re sensitive and respectful), and you may end up learning more in those couple of days than you do for the rest of your trip. Many travelers to Myanmar are surprised to find a culture and way of life that has remained relatively unchanged in the last few centuries. And while you’ll certainly find aspects of culture that are authentic, traditional, and untouched by tourism even in the bustling cities, if you really want traditional culture, get out to the countryside. The trek takes you through the Pa’O tribe, which is one of the largest ethnic minorities in Myanmar, with its own set of customs and traditions, its own language (shared with the Karen people), and even its own clothing. So you’ll really get a unique cultural experience that you won’t find outside of these areas. Despite often feeling like I was in the middle of the wilderness, my trek really was filled with rich human experiences that simply don’t exist in the cities or at hotels. In the morning, I watched as parents woke up before the sun to say their prayers and head out to the farms for the day. Just a few kilometers later, I passed a large crowd of men sitting on a hillside, which my guide explained was a funeral. Apparently, gambling is illegal in Myanmar expect for three days following a funeral, during which time addicts get their fix and locals gather to play card games. And as I walked a bit further, just as the sun was setting, I joined the mass exodus of farmers returning home from a long day in the sun — the village “rush hour,” minus the vehicles. Along with a number of buffalo, young children, and small elderly women carrying massive bags of rice and vegetables, I made my way up the hillside in a very slow race against the setting sun. You’ll not only fall asleep and wake up in a village, but you’ll also stop in villages for lunch or tea breaks, and will pass through many others, so there’s plenty of opportunity to observe human activity and cultural practices, and certainly to learn something new about what you see from your guide. The Myanmar diet is a beautiful, fattening smorgasbord of deep fried meats and carbs. Personally, I think it’s delicious, despite it’s less-than-stellar reputation among travelers and expats. But healthy, it is not. I’m a huge proponent of finding ways to stay fit and healthy while traveling, without missing out on the joys (ahem — delicious foods) of the places you’re visiting. Hotel gyms can be hard to come by in Myanmar, so the thought of having a couple of days of straight physical activity was irresistible for me. Even if you’re not very physical active, you can still enjoy the trek at your own pace. It’s not a strenuous or challenging climb, and you can take breaks for as long and as often as you like, especially if you choose to take a private trek. And I promise, at the end of the day, as you devour your feasts of fried noodles and fish and chicken curry and endless plates of fresh fruit, you’ll actually feel pretty darn good about yourself and what you accomplished on just your own two feet. Like I said, I fully support efforts to stay healthy and active while traveling without saying no to good food. Food is, by far, one of my favorite things about traveling. And despite how little excitement I heard regarding Burmese cuisine from travelers and expats alike, I absolutely loved the foods I ate in Myanmar. Surprisingly, the foods along my trek were particularly delicious. It was in these rural villages that I had some of the tastiest chicken curries, tomato-stewed fish, fresh salads and fruit, and homemade Burmese candies. Not to mention the beautiful hospitality shown at each meal, where despite having so little, the hosts went above and beyond to display meals and individual dishes as art forms. And the best part is, you can eat every last bite of what’s put in front of you without any guilt, because hullo — you just walked 15 kilometers today. Have the extra spoonful of rice! In true Buddhist form, your trek will give you the opportunity to get some peace, quiet, and solitude before returning to your busy life back home. Even if you don’t practice meditation, I’d suggest you avoid the temptation to hop from destination to destination as quickly as possible while in Myanmar. It would be a shame to leave a country filled with such peaceful, spiritual people without personally taking the time to slow down and reflect. Your trek is the perfect opportunity to do this. Use the hours of silence, immersed in beautiful nature, to really reflect on your experiences, be thankful for the opportunities you’ve had to travel, and internalize whatever lessons you’ve learned so far during your time in Myanmar. One tip that helps me really focus on my surroundings and be present, is to stop what you’re doing, close your eyes, and identify every single sound your can hear. Focus on the sound of each different chirping bird, the wind rustling the leaves in the trees, the groaning of a distant buffalo, and even your own heartbeat. Count how many different sounds you can hear, which is less about keeping track of the quantity and more about forcing yourself to really isolate and focus on each different piece of your surroundings. If this all sounds a bit too fluffy for you, that’s okay. I’d still encourage you to give it a shot. But at the very least, your mind and body will thank you for the opportunity to recharge after flights, buses, city tours, and chaotic traffic. 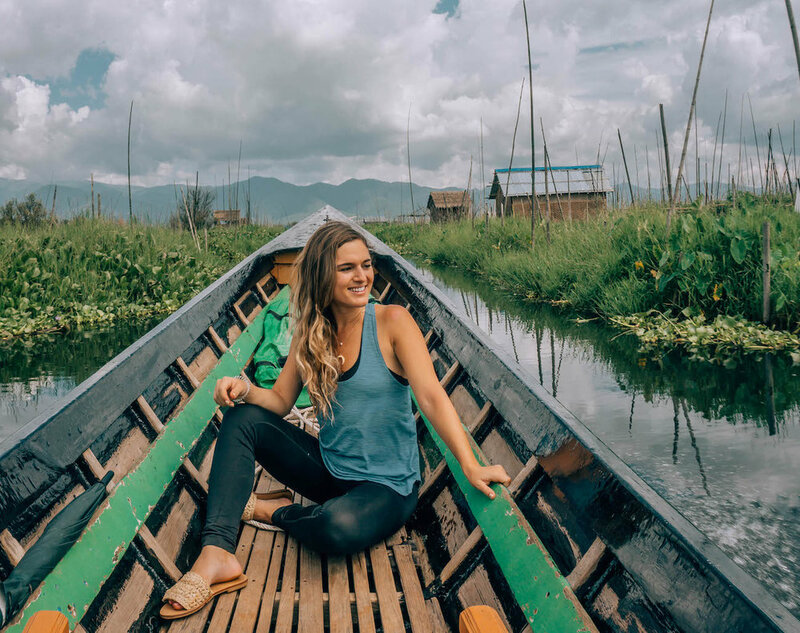 You’ll land in Inle Lake feeling re-centered and ready to take on the rest of Myanmar and whatever awaits you back home. As a preliminary note, I showed up for my trek completely unprepared without having done any real research, and I was fine. But there were a few things I learned along the way that would’ve made the experience a bit more comfortable, a few positive “accidents” that I now can eagerly recommend to you, and a few basics that will be helpful for those of you who haven’t done a similar trek before. You’ll need to hire a guide for your trek between Kalaw and Inle Lake. I definitely wouldn’t suggest trying to go it alone for a few reasons. First, the trails appear pretty random, and aren’t marked for trekkers, so you’ll almost certainly get lost. Second, in some of the villages, or if you’re trying to set up a bed at a monastery, you’ll be hard-pressed to find someone who speaks English — your guide will be able to help translate. Third, without a guide you’ll miss out on so much of the cultural insights and education that makes the trek so wonderful, as well as explanations of the tribes, wildlife, and other people, places, and things you pass. Fourth, the tourism industry in Myanmar is struggling, and these guides really need travelers like you in order for them to feed their families. I recommend finding a guide that speaks English well, so that you can learn as much as possible and have all those interesting conversations I told you about. My guide, Mr. Qual, was amazing, and I highly recommend you hire him for your own trek. If you want to hire a guide on arrival, you may be able to save some money by bargaining down the prices a bit. But this can take some time, and you’ll run the risk of not having the best guide possible. Proper hiking shoes: Although it’s possible to do the trek in regular running shoes, if you have hiking boots, I’d recommend those. My feet were killing me by the end of day two in my Nike sneakers, and in the off chance it rains while you’re trekking, you’ll really need shoes with proper support and grip. Waterproof backpack: Speaking of rain… hopefully you’ll only have blue skies on your trek, like I had on mine. But rain is of course possible, especially if you’re traveling during off season. If it does rain, in addition to proper hiking shoes, you’ll want a backpack that is waterproof or has a waterproof cover, so all your clothes and toiletries don’t get soaked. Even packing one or two of the plastic rain ponchos sold in most cities is a good idea: one for yourself, and one to wrap around your bag if needed. Sunscreen: I didn’t wear it, and even as I write this post two weeks later, I have some terrible tan lines thanks to my failed efforts to lotion up. Don’t underestimate the sun during your trek — even if you have lots of shady sections and don’t feel particularly hot, the sun is strong and there’s a good chance you’ll burn. Camera: No explanation needed. Be sure to bring an extra memory card, just in case. Snacks: Although you’ll be able to find spots to stop along the way with fruit or other foods, there may be stretches of the trek where you’re really in the middle of nowhere. It’s a good idea to bring some energy bars, nuts, or other healthy snack for those times, or for when you need something more substantive or nutritious than fruit or fried rice. Proper trekking clothes: Avoid shorts if you don’t want to get cut up from the scraggly brush through which you’ll have to walk. I wore one pair of yoga pants both days, and brought one clean workout shirt and a clean pair of socks for day two, some monastery-appropriate sleeping clothes, and a light sweater for the chilly nights (and trust me, it does get surprisingly chilly). Toiletries: Anything you’ll need, you’ll need to bring for yourself. In addition to a toothbrush, toothpaste, and face wipes, this includes toilet paper, as well as a towel and soap if you want to shower (but I’ve found that those wet cleansing wipes do just fine for a day or two). Bug spray: There will likely be mosquitoes. Don’t let them ruin your trek. Power bank/portable charger: Most likely you’ll stay in a village that has no electricity. Some houses will have solar energy, but it’s very limited and may not run all night, so if you want to charge up your phone or camera, be sure to bring a full power bank or portable charger. Timing: There are two main trekking options between Kalaw and Inle Lake: a 2-day/1-night option, or a 3-day/2-night option. Because I was pressed for time, I opted for the 2-day trek, but if I had had the time I would’ve absolutely chosen the full 3 days. The first stretch of the trail is the most difficult, as you’ll climb the highest hill. But this also means you’ll get the most beautiful views. And unfortunately, you’ll skip over this day if you choose the shorter 2-day trekking route. Cycling: If trekking isn’t your thing, you can also choose to do a cycling tour. I’m useless on a bike, so this idea sounded terrible. But from what I’ve heard, it’s really beautiful, and much of it is on the roads rather than the narrow and unpaved dirt paths that trekkers take. Costs: If booked in advance, the 2-day trek will cost about $90-100 for a private tour. This includes the guide, accommodation (you may be able to save a few buck if you stay in a monastery), all meals/water/snacks along the way. You can probably save some money by bargaining with guides when you arrive to Kalaw, but you’ll lose time and the assurance that you have an awesome guide. Although it’s not cheap, I recommend booking in advance to avoid confusion when you arrive, but it’s of course up to you and depending on your budget. Of course, you’ll cut down costs if you join a group trek, or if you split the cost among friends. However, I’d encourage you to try a private trek if possible, because you’ll be much more likely to have interesting conversations with your guide than you would if you’re with a bunch of other trekkers, and you’ll have the opportunity to grow from the peace & solitude rather than having just another social experience. You’ll also need to pay the 10 USD zone fee once you arrive to Inle Lake at the end of your trek. Be sure to have enough cash on hand for this. If you didn’t already have an Inle Lake trek on your Myanmar itinerary, I hope this post convinced you to add it. From stunning landscapes, to fascinating rural culture, to enlightening conversations with your guide, this trek is just as rewarding to the outdoor enthusiast as it is to the athletically-disinterested foodie or cultural traveler. It was one of the highlights of my trip to Myanmar trip, and I’m confident it will be one of yours, too! Any questions or tips to add about trekking to Inle Lake? Let me know in the comments!